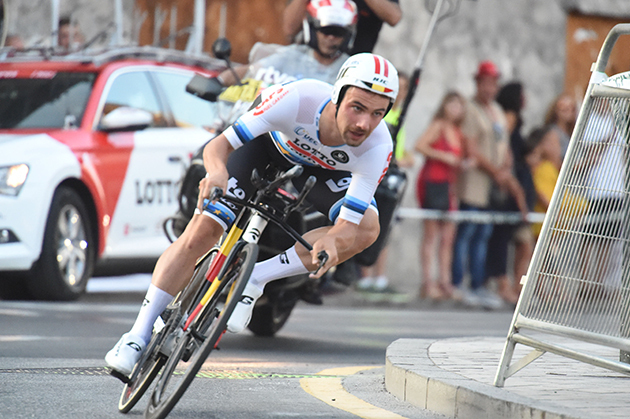 After his European title, Victor Campenaerts wants to perform strongly in the TT of the World Championships on Wednesday as well. Lotto Soudal’s time trial specialist has to cover a 52.5 kilometres long course with an elevation gain of 654 metres before crossing the finish line in Innsbruck. Considering the Gnadenwald, a climb of almost five kilometres long and gradients up to 14%, the course is suited for the time trialists with climbing legs, reducing Campenaerts’ chances on getting a medal. Yet, he hopes to match the Belgian record and finish inside the top six. About the women's time trial, Team Sunweb's coach Koen de Haan (NED) said: "The ITT takes place over 27.8 kilometres with a pretty flat start and some climbing in the second part of the course; this is a course that will suit all-round strong riders. With Leah and Ellen we have two national TT champions on the start list, with Ellen also the European TT title holder. We think that this course could also suit Lucinda who has shown some good results in the discipline this year. This is also her first time riding the TT worlds so it will be a good experience for her regardless of result. Our young riders Pernille and Juliette will also start at the TT and both have put focus on their TT development and preparation to go for a good result in Austria." Team Sunweb's coach Adriaan Helmantel (NED) said: "The men's TT course looks a bit like the TTT course; first there is a long, flat part followed by a climb that's a little bit harder than yesterday and then the last kilometres are constantly up and down. Yesterday we showed with Tom, Wilco and Søren that it's a course that suits them well. With Tom as defending champion we definitely have a race favourite on the team, he would probably like the first part to be even harder but it's still a course that puts him in contention for another medal. "We have four really strong guys starting in the U23 TT this afternoon; their course is 27.8 kilometres in length and could suit a guy like Lennard. We also have Marc who was the U23 Swiss national champ last year and has a really good TT. Max is in top shape at the moment after a two stage wins at Olympia's Tour so it will be good to see where he is at later today, alongside Sergio, who rounds out our U23 worlds TT squad." Team Sunweb's coach Koen de Haan (NED) said: "The women's road race will be a hard 156 kilometre race, with three final laps and a decisive uphill, so is suited to the climbers. Ruth showed her good climbing legs with two stage wins in the Ardeche and Liane also showed she is in good shape with a stage and GC win at the Belgium Tour. The rest of the team have just come out of a good training block and racing period. Our wins at Madrid Challenge were a good boost for morale and all of our riders will go all in for a chance of the rainbow jersey." Team Sunweb's coach Adriaan Helmantel (NED) said: "The road race is a really tough course, definitely the toughest parcours we've seen in recent years. The route involves six short laps and a long lap with a really hard climb, totalling 258 kilometres with 4670 metres of elevation gain. We don't necessarily have the specialists for these kind of parcours but we are sure that our riders will play a part in helping bring a medal home for their native country. Søren, Tom, Wilco and Sam are in great shape after a silver in the TTT and both Chris and Simon will be really valuable support riders for the Australian and German national teams. "The U23 race is 179.9 kilometres with 2910 metres of elevation gain and steep climbs up to Angerberg and Gnadenwald. We've got a good selection of guys that are suited to these parcours such as Jai, who performed really well on the toughest stages of the Vuelta as well as Marc who has good climbing legs. We're confident that our young guys will put on a good show in Austria, be it in a support or leadership role with their national team."